The rich, old-fashioned taste of King Caramel Classic takes you back to Grandma’s kitchen. Smooth and simple – never sticky. Truly timeless. 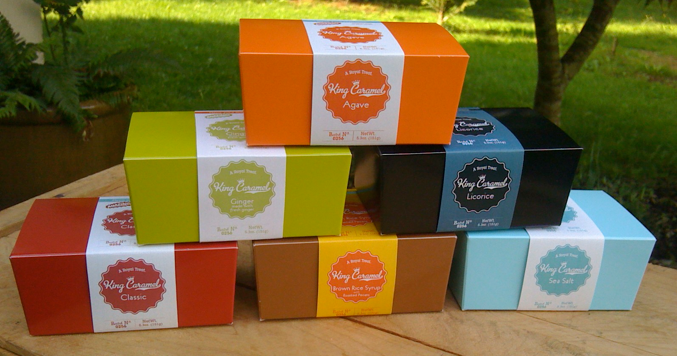 Available packaged in 1/3# King Caramel Gift Box or in bulk for your holiday candy dish. Surprisingly subtle, this sweet and spicy treat melts in your mouth with a mild, lingering finish worth savoring. Coveted by connoisseurs, this gluten free licorice caramel is a delicate balance of smooth buttery goodness with a smooth licorice bouquet. The perfect marriage between texture and taste. With each caramel-coated crystal like buried treasure, it’s sweet and salty satisfaction. FINALLY! Order your favorite king caramel flavor online. Crafted from organic agave nectar, this silky sweet caramel boasts a delicious and sustainable alternative to corn syrup. Fit for a Queen. An overwhelming favorite among men. Packed with fresh roasted pecans, this rich caramel is made from brown rice syrup - not corn syrup.